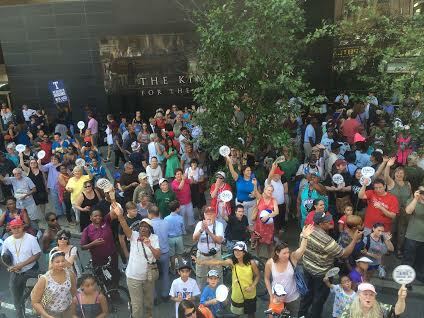 Thousands of Philadelphia sports fans gathered near the Kimmell Center to welcome home the Taney Dragons and hear the Philadelphia POPs Orchestra salute to the team for their successful run to the Little League World Series. Photo by Chris Murray. 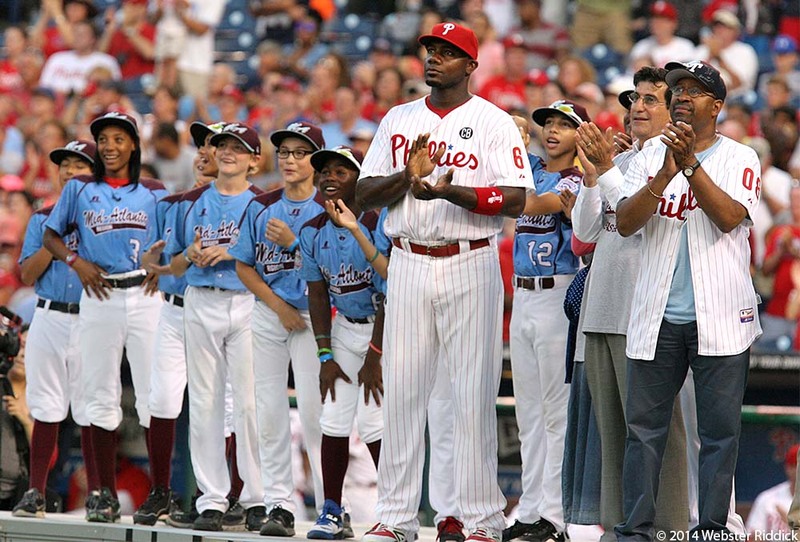 After the Parade down Broad Street, the Taney Dragons were honored by Ryan Howard and the Philadelphia Phillies at Citizen’s Bank Park before Wednesday’s game against the Washington Nationals. Photo by Webster Riddick. PHILADELPHIA –A lot of people who would normally be hard at work in their Center City offices were instead gathered on the streets of Philadelphia in support of the Taney Dragons Little League team as part of a parade honoring the Mid-Atlantic Little League champions Wednesday. Waving signs that said, “We Love Taney,” “We’re on the Dragon Wagon,” and “Let’s Go Taney,” a crowd of thousands took part in the parade, which also featured performances by the Philly POPS orchestra in front of the Kimmel Center and the Mummers at Broad and Washington. In the midst of a tumultuous summer on the streets of Philly and around the world, the Dragons, a multi-ethnic team of 12 and 13-year-olds, gave everyone something to smile about during their Little League World Series run in Williamsport, Pennsylvania, said Mayor Michael Nutter. Taney Dragons pitcher Mo’ne Davis and her teammates took a victory lap around Citizen’s Bank Park. Photo by Webster Riddick. 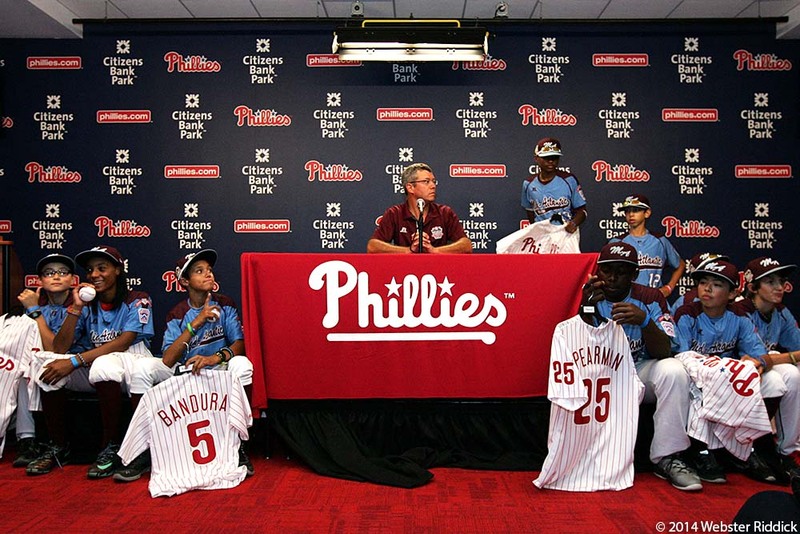 The Taney Dragons were one of two inner city teams to play in the LLWS, and the first from Philadelphia. They, and the U.S. Champion Jackie Robinson West team from Chicago, became favorites of fans around the country and garnered a lot of media attention in the process. Taney manager Alex Rice applauded his kids for how they’ve handled it. Though the Taney Dragons finished third, they received a heroes’ welcome from a grateful hometown on Wednesday in a parade that went from downtown to Franklin D. Roosevelt Park in South Philadelphia. 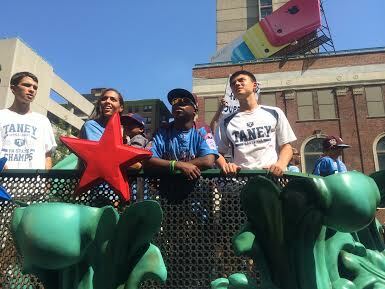 Taney Dragons second baseman Jahli Hendricks looks out into the crowd during the parade down Broad Street. Photo by Chris Murray. After marching down Broad Street, Mayor Nutter and Second District City Councilman Kenyatta Johnson honored the team with a proclamation and announced plans provide more resources to recreation programs in the city and repair the city’s baseball fields. Later in the day, the team went to Citizens Bank Park where the Philadelphia Phillies honored them and let entire team threw the ceremonial first pitch. They also got some encouragement from Phillies first baseman Ryan Howard, who spent time with them in Williamsport. For the kids, it has been a whirlwind last couple of weeks with games and celebrations. This is especially true for 13-year-old pitcher Mo’ne Davis, who thrilled fans and dazzled with her 70-mile per hour fast ball and became the darling of the Little League World Series. Davis was the toast of the morning TV talk shows including ABC’s Good Morning and became the first Little Leaguer to grace the cover of Sports Illustrated. By the time the parade ended, a visibly-tired Davis talked to reporters about the run through the Little World Series. The solid of performance of both the Taney Dragons and the all-Black U.S. champion Chicago Jackie Robinson West squad marked the comeback of urban baseball. The Taney Dragons squad was a multi-ethnic squad that looked more like America. “I ran with my kids from Philadelphia, they were a perfect cross section of Philadelphia and I was thrilled with ther talent that made the team and I loved them,” Rice said.